We’d love your help. Let us know what’s wrong with this preview of How Rocket Learned to Read by Tad Hills. With a story that makes reading fun—and will even help listeners learn to read—this book is ideal for kindergarten cla Learn to read with this New York Times-bestselling picture book, starring an irresistible dog named Rocket and his teacher, a little yellow bird. Follow along as Rocket masters the alphabet, sounds out words, and finally . . . learns to read all on his own! To ask other readers questions about How Rocket Learned to Read, please sign up. 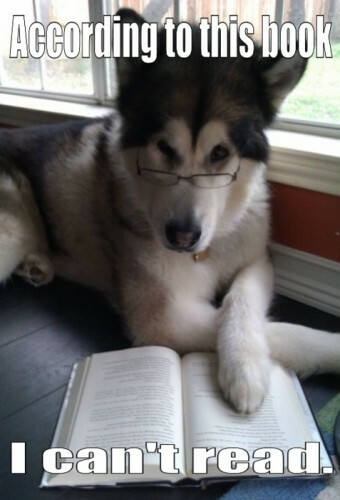 An inspiring short story about the dog who has hunger for learning. What a cute little story! 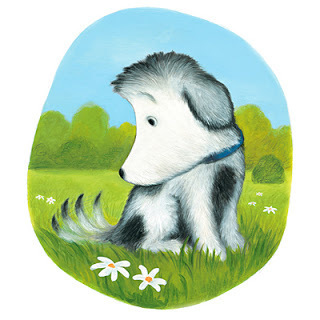 How Rocket Learned to Read is a tale about an ordinary dog who encounters an extraordinary bird. All Rocket wants to do is take a nap, but the little yellow bird wants to teach him to read. When Rocket ignores her, she starts to read a story out loud and eventually draws him in. She then proceeds to teach him the alphabet, and then to sound out words. Soon, they're spelling all kinds of things. But as winter approaches, school draws to a close and the little yellow bird What a cute little story! How Rocket Learned to Read is a tale about an ordinary dog who encounters an extraordinary bird. All Rocket wants to do is take a nap, but the little yellow bird wants to teach him to read. When Rocket ignores her, she starts to read a story out loud and eventually draws him in. She then proceeds to teach him the alphabet, and then to sound out words. Soon, they're spelling all kinds of things. But as winter approaches, school draws to a close and the little yellow bird flies south. Rocket is left on his own to put his new knowledge to good use. The story is cute, but the pictures are even cuter. Rocket looks so soft and cuddly that you just want to give him a hug. His early reluctance about learning to read gives way to enthusiasm when he realizes just how much fun it can be. The illustrations of him learning new words and how to spell them are some of my favourites in the book. This is a very cute book about a reluctant reader who eventually comes around with the help of a special friend and teacher. I would definitely recommend this one! Early the next morning, Rocket rushed to his classroom. As he waited, he spelled W-A-G. I was smiling throughout this adorable book because the illustrations, particularly of Rocket the dog, are so expressive. Rocket’s facial expressions are a hoot; they are so cute. If the story is read to kids who love books and/or are eager to learn to read, I think this is a fabulous book. (If the book is used to try to coerce or entice reluctant readers or reluctant listeners, I’m not as big of a fan of it.) But, I’ve always loved books and reading, and dogs, and I’d have always loved this book I was smiling throughout this adorable book because the illustrations, particularly of Rocket the dog, are so expressive. Rocket’s facial expressions are a hoot; they are so cute. If the story is read to kids who love books and/or are eager to learn to read, I think this is a fabulous book. (If the book is used to try to coerce or entice reluctant readers or reluctant listeners, I’m not as big of a fan of it.) But, I’ve always loved books and reading, and dogs, and I’d have always loved this book. The story is so funny and sweet, Rocket is an endearing character, and it’s a book about learning to love learning and books/stories and learning ABCs and reading. I loved Rocket’s journey from wanting to play and be left alone to eager student to independent learner and more advanced student, and got a kick out of how he continued his studies even after his teacher, a bird, has flown south for the winter. This is my first Tad Hills book but I see he’s written many other books, and I’m now eager to check them out. I loved this book. Great extra! : On the back inside cover, in the author’s bio section, there’s a photo of the author-illustrator with the real Rocket, who the reader is informed has not yet learned how to read. This was such a wonderful surprise! I haven't read any of Tad Hills' work before but I'm definitely going to read more of it now. This is the gently humorous, inspiring and heartwarming story of how a young pup named Rocket became interested in the wonderful world of words. His teacher is a wise, bright-spirited yellow bird and she entices him with fascinating stories in books so that he understands why words are important and powerful and necessary. Then, when she flies south for the winter, Roc This was such a wonderful surprise! I haven't read any of Tad Hills' work before but I'm definitely going to read more of it now. This is the gently humorous, inspiring and heartwarming story of how a young pup named Rocket became interested in the wonderful world of words. His teacher is a wise, bright-spirited yellow bird and she entices him with fascinating stories in books so that he understands why words are important and powerful and necessary. Then, when she flies south for the winter, Rocket continues to revel in his ABCs. Rocket is an adorable little dog who, one day, finds himself in the company of a very persuasive birdie. The little yellow bird decides it is going to be Rocket's teacher, and the first thing Rocket learns is how to read. I love the way this story approached education and reading - instead of demanding that Rocket "needed to learn his ABCs" the little birdie instead introduces Rocket to the wonder of stories found in books, so that Rocket *wants* to learn to read so that he, to Okay, I loved this! I love the way this story approached education and reading - instead of demanding that Rocket "needed to learn his ABCs" the little birdie instead introduces Rocket to the wonder of stories found in books, so that Rocket *wants* to learn to read so that he, too, can partake of such glorious stories. As I was reading, I kept thinking, "This book should do this. They should address that." And every time, the book did! It was fantastic! Rocket the dog learns to read after attending lessons each season with a clever yellow bird. A great book for launching a reading year with young children. 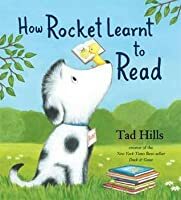 How Rocket Learned To Read written and illustrated by Tad Hills is a charming book that follows a dog named Rocket on his road to learning how to read. Rocket the dog has a teacher, a little yellow bird, who encourages the dog to come to lessons. Rocket is not interested at first, but becomes interested in reading as he listens to the bird tell a story about a bone. 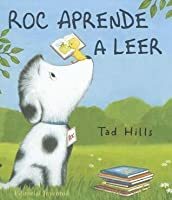 As Rocket comes to the bird’s lessons, his love for reading becomes more and more voracious, and as he learns, his whole world arou How Rocket Learned To Read written and illustrated by Tad Hills is a charming book that follows a dog named Rocket on his road to learning how to read. Rocket the dog has a teacher, a little yellow bird, who encourages the dog to come to lessons. Rocket is not interested at first, but becomes interested in reading as he listens to the bird tell a story about a bone. As Rocket comes to the bird’s lessons, his love for reading becomes more and more voracious, and as he learns, his whole world around him becomes rich with meaning. This book not only has a fantastic story, but it has beautiful illustrations to match. The pictures seem to be drawn with a mix of colored pencils and paint. The expressions of the dog and bird are convincing and hilarious! This book is a fantasy book, since the main characters, a dog and bird, are able to talk and read. This book would be a perfect read for a kindergartener who is just starting to learn how to read. This book would be especially useful to read to children who are discouraged readers. Together with Rocket, students can draw letters and spell out words like D-I-G and W-I-N-D. Rocket’s road to literacy starts with the basics of learning letters, but he preservers and learns to read on his own. What a great role model for young children! I believe this book deserves a place in the homes of young children and in kindergarten classrooms. عصفور يعلم الكلب روكت القراءة. Opening: Have you ever learned something new? What have you learned about? In our story today, Rocket the dog meets a bird who loves to teach. At first Rocket doesn't think he will like learning, Have you ever not liked learning? Well the bird in this story helps to change Rockets mind, and when he does he changes Rockets life for the better. Let's read to find out what happens to Rocket in the story, How Rocket Learned to Read. Raise questions to spark c Opening: Have you ever learned something new? What have you learned about? In our story today, Rocket the dog meets a bird who loves to teach. At first Rocket doesn't think he will like learning, Have you ever not liked learning? Well the bird in this story helps to change Rockets mind, and when he does he changes Rockets life for the better. Let's read to find out what happens to Rocket in the story, How Rocket Learned to Read. Raise questions to spark curiosity. Rational: This book is sweet story about learning. It is a great book to use at the beginning of the year to introduce helping others with learning. The students love the cute illustrations and spelling/sounding out along with the story. The bird and dog in the story create a friendship and Rocket is taught the gift of reading. The students can relate with the storyline of learning new things as well as the level of spelled words in the story It is a class favorite, guaranteed! 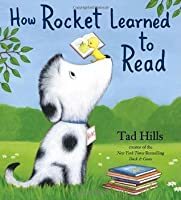 How Rocket Learned to Read by Tad Hills is an encouraging picturebook about learning to read and the love of reading. (Apparently also marketed as an easy reader, some of the vocabulary is above easy reading level). The text moves the story along nicely, but the pictures are the stars here. The illustrations were done in oil paint and colored pencils. Rocket is shown experiencing many emotions as he works to learn to spell and read. Parts of the story made me think of City Dog, Country Frog, and I'm glad the little bird returned in the Spring. It's on the edge of being too sweet, but I still liked it a lot. Audience: The audience for this book would be primary grades. Kindergarten to second grade would enjoy this book because it is about learning how to read. Appeal: This book is appealing to kindergartners up to second graders because they too much like Rocket are in the process of learning how to read. They are learning from a teacher and practicing independently to master such skills. Students can connect to listening to stories, learning the alphabet, learning to say and spell words, using words Audience: The audience for this book would be primary grades. Kindergarten to second grade would enjoy this book because it is about learning how to read. Appeal: This book is appealing to kindergartners up to second graders because they too much like Rocket are in the process of learning how to read. They are learning from a teacher and practicing independently to master such skills. Students can connect to listening to stories, learning the alphabet, learning to say and spell words, using words to form sentences, using sentences to create a story, and reading to understand the meaning of those words. Application: I would use this book in the classroom to make students feel comfortable at their level of literacy and to explain the process of how we all learn how to read. How Rocket Learned to Read is a story about how a bird teaches a dog (rocket) how to read. The little yellow bird did not give on when teaching Rocket to read. At first Rocket was not very thrilled about learning to and instead he wanted to sleep. This would be a cute book to use during a carpet read. This book would be great to use when students are first learning to read. How Rocket Learned to Read This is a very cute story about a puppy who learns to read (as the title indicates). I enjoyed the illustrations and I especially loved how the author incorporated a little yellow bird, the puppies teacher, who makes reading and learning fun for the puppy. This book would appeal to elementary children (grades K-3rd) who are learning to read, interested in learning to read or just simply enjoy reading! This book is from the Golden Sower Award list. This delightful story features a quirky yet recognizable pair (the initially reluctant student and the enthusiastic teacher) in the unlikely form of a dog and a little yellow bird. The text, a charming hymn to the "wondrous, mighty, gorgeous alphabet," begs re-reading as much as the charming, tranquil illustrations invite a second look. A creative introduction to reading through onomatopoeia and a fun read-aloud for both children and adults. The best thing about this book is what Tad Hills doesn't say about how his dog Rocket learns to read. Rocket doesn't sit in front of a computer screen, an "educational" children's show, or a canned curriculum program to learn to read. Rocket learns to read by experiencing the world, and his teacher is a bird. Read: nature, Hills' nod to Thoreau, who went to the woods to learn. This is a fantastic picture book. The little puppy named Rocket met a bird friend who starts to teach Rocket how to read. He isn't thrilled about it a first, but he get's engaged into the stories and doesn't stop spelling words. This book would be used for a K-2 classroom to get them excited for reading. This wonderful children's book tells the story of how a little yellow bird taught Rocket the dog the joy of books and reading! It's tickling my saccharine meter ever so subtly, but I'll give it a pass as this is a story with which many young reluctant readers may identify. This book tells the story of a dog named Rocket and his teacher, the bird. At first, Rocket is hesitant and quite annoyed with the bird who wants to teach Rocket how to read. However, when Rocket is enticed by the bird’s story of a dog named Buster he is suddenly interested in wanting to learn how to read. When spring is over, the bird leaves and tells Rocket to keep practicing, as he will return the next spring. So Rocket does until the bird returns again. I would say that the theme of this st This book tells the story of a dog named Rocket and his teacher, the bird. At first, Rocket is hesitant and quite annoyed with the bird who wants to teach Rocket how to read. However, when Rocket is enticed by the bird’s story of a dog named Buster he is suddenly interested in wanting to learn how to read. When spring is over, the bird leaves and tells Rocket to keep practicing, as he will return the next spring. So Rocket does until the bird returns again. I would say that the theme of this story would be the excitement about learning how to read and the want to learn how to read. Reading can be a very difficult thing for a lot of children and something they may not even want to learn how to do. However, this book shows that it may not be as bad as they think and may even grow to like reading much as Rocket did. A lot of young readers are hesitant to the idea of learning how to read but this book opens up the child to understanding that reading can be something they look forward to. I would give this book four out of five stars because I think that this story is presented in a very playful way. Imagining a dog and a bird becoming friends over reading is something that a child would enjoy reading about. I think the pictures in this book are also something that a child would be very interested in. I really enjoyed reading this book. I enjoyed the playful manner between the dog and the bird and how the bird got Rocket to read. I also really enjoyed the pictures in this book. I think that children will also love the simplicity of the book and find the message in the book helpful and impactful. Rocket is a typical dog--digging holes, wagging his tail, taking naps. But things change when a yellow bird arrives in his yard and announces that Rocket is her student. Rocket is too tired from doing dog things to go to class, but he’s intrigued when the bird starts to read a book out loud. He’s upset when she stops and flies away before he learns what happens in the story. The next morning, he’s at the clearing that serves as a classroom before the bird. She’s delighted to see him, finishes re Rocket is a typical dog--digging holes, wagging his tail, taking naps. But things change when a yellow bird arrives in his yard and announces that Rocket is her student. Rocket is too tired from doing dog things to go to class, but he’s intrigued when the bird starts to read a book out loud. He’s upset when she stops and flies away before he learns what happens in the story. The next morning, he’s at the clearing that serves as a classroom before the bird. She’s delighted to see him, finishes reading the book, then teaches him the alphabet. He goes to class until winter and the bird migrates south. Even then, he associates sensations with the words that name them: WIND, COLD, SUN, and MELT, finally! When the yellow bird returns, the student and teacher read together, and when they finish their books, they re-read them again and again. Rocket, initially uninterested in yellow bird’s school and learning to read, but he becomes captivated by the book yellow bird is reading and decides to pay attention. He’s an enthusiastic student; even when the yellow bird was gone for the winter, Rocket practiced spelling and looked forward to school resuming. His eagerness and delight in reading might be contagious and certainly provides a good model for beginning readers. The text has some challenging words--wondrous, mighty, gorgeous, and glorious, for example--though they are usually repeated which would give readers practice with the new words and context to understand them. While I embrace the message of the book and even find Rocket endearing, to me, the writing style and illustrations seemed anachronistic, reminding me of children’s books published not when I was a child--which was a long time ago--but even before then. Brief assessment of the book’s quality (artistic, literary, intellectual merit) – no more than two sentences: There’s a lot of text for a short book, but the illustrations are very accessible for children. The message about learning to read is wonderful. Brief assessment of potential use of book with young readers, if applicable (storytime, curriculum support, summer reading list, etc.) – no more than one sentence: This would be an excellent book to help get pre-literate and barely-literate children engaged with the reading process, particularly with the alphabet and sounding out the words Rocket is spelling. Brief assessment of books’ appeal to potential readers - no more than two sentences: Despite the large amount of text, the illustrations do an excellent job of conveying the main ideas of the story throughout. What really caught my eye was that Rocket’s images looked soft enough to pet. That artwork shows the emotion and engagement of Rocket really well. I'd like to see more of Mr. Barker! That artist is really skilled at including texture within images to add softness. I am a little confused by whether the letter being spelled with leaves by the bird is an incomplete V or the start of W or something else. How Rocket Learned to Read is about the relationship between a dog named Rocket and a yellow bird. It begins in the summer time when the bird takes Rocket in as her student and tries to teach him how to read. As rocket begins to learn letters, the seasons change, and eventually, it gets too cold for the bird to continue teaching. While the yellow bird is gone, Rocket spells out all his friend’s names and continues to practice. Thankfully, winter ended, and the bird came back to continue teaching How Rocket Learned to Read is about the relationship between a dog named Rocket and a yellow bird. It begins in the summer time when the bird takes Rocket in as her student and tries to teach him how to read. As rocket begins to learn letters, the seasons change, and eventually, it gets too cold for the bird to continue teaching. While the yellow bird is gone, Rocket spells out all his friend’s names and continues to practice. Thankfully, winter ended, and the bird came back to continue teaching Rocket. They read together and Rocket finally learned to read all thanks to the bird. The overall theme of How Rocket Learned to Read is friendship. Rocket makes a friend in the bird and learns a lot from her. This book shows how we can always learn new things from our friends. When I read this story, it made me happy to see two characters from different backgrounds become friends. This is true for humans as well. Since being in college, I have had so many opportunities to meet people from all different backgrounds and places, and I feel like I can relate to this story! “Whenever I picture myself [as a child],” says Tad Hills, “I am doing art. I spent a lot of time on my own making things, drawing, and painting.” Hills was not consciously trying to become an artist, rather his motives were innocent and pure. “I liked making things,” he says. As a graduate of Skidmore College in New York with a degree in art, Hills describes himself as the ultimate freelancer. He’s “Whenever I picture myself [as a child],” says Tad Hills, “I am doing art. I spent a lot of time on my own making things, drawing, and painting.” Hills was not consciously trying to become an artist, rather his motives were innocent and pure. “I liked making things,” he says. As a graduate of Skidmore College in New York with a degree in art, Hills describes himself as the ultimate freelancer. He’s done some acting, made jewelry, makes fake teeth for stage productions, dabbled in interior renovation, and illustrated book jackets for adult trade books. But Hills’ break into children’s publishing coincided with his wife Lee’s new position as the art director for Simon and Schuster’s children’s book division. “Lee used to ask me to try illustrating some books she couldn’t find an illustrator for,” Hills says. When Lee moved to Random House to start her own imprint with long-time friend and associate, Ann Schwartz, she encouraged Hills to write his own picture books. “I started with four stories,” says Hills. His break out book, Duck and Goose (Schwartz and Wade, 2006) was one of them. The idea for Duck and Goose started with only a title—The Silly Goose, the Odd Duck and the Good Egg. As Hills developed the story, he realized his egg would have to be rather large to support Duck and Goose so they could hatch it. Hills also had to consider what would hatch out of such a large egg. A dinosaur? An ostrich? Additionally, Hills floated the title by his son’s kindergarten class and was rewarded with blank stares. Hills took the hint and changed his egg to a ball, and changed the title. As Hills’ two children grow, he finds himself drawn to how kids treat each other. “I didn’t tolerate meanness or injustice as a kid,” he says. In Duck, Duck, Goose (Schwartz and Wade, 2007), Hills creates a friendship triangle by introducing a new duck named Thistle. Together Duck, Goose, and Thistle give Hills’ observations a voice and provide several conversation starters for parents and children.